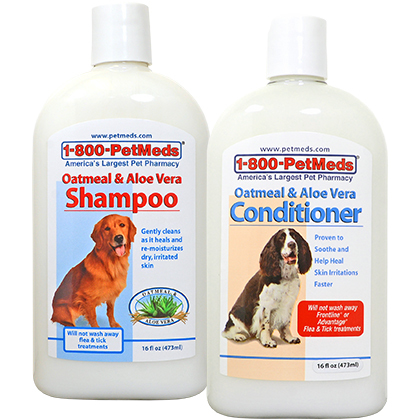 What is 1-800-PetMeds Oatmeal & Aloe Vera Shampoo and Conditioner Combo Pack? This Combo Pack contains one 16-ounce bottle of 1-800-PetMeds Oatmeal and Aloe Vera Shampoo and one 16-ounce bottle of 1-800-PetMeds Oatmeal and Aloe Vera Conditioner. The combination gently cleans as it heals and re-moisturizes dry and irritated skin. Both made in the USA. Buy one 16-ounce bottle of 1-800-PetMeds Oatmeal and Aloe Vera Shampoo separately. Buy one 16-ounce bottle of 1-800-PetMeds Oatmeal and Aloe Vera Conditioner separately. Oatmeal is used to moisturize skin and stop itching. Aloe is used to soothe skin and promote healing. 1-800-PetMeds Oatmeal & Aloe Vera Shampoo and Conditioner (Combo Pack) will not wash away flea and tick treatments. Safe for dogs, puppies, cats, and kittens 12 weeks of age or older. Shampoo your pet once a week or as often as recommended by your veterinarian. For topical use only. Thoroughly wet your pets coat with warm water. Shake bottle of shampoo well and massage small amounts of the shampoo into the coat while continuously adding water. Continue until a generous lather is formed. Rinse well. After shampooing, apply conditioner and massage deep into coat and skin. Rinse well. Store this product in closed container in a cool, dry place. Ingredients: Deionized Water, Sodium Laureth Sulfate, Cocamidopropyl Betaine, Lauramidopropylamine Oxide, Sodium Laurel Sulfate, USP Colloidal Oatmeal, Pure Aloe Vera Gel, Sodium Chloride, Glycol Stearate, DMDM Hydantoin, Tetrasodium EDTA, Citric Acid. Ingredients: Water, Stearalkonium Chloride, Aloe Vera Gel, Hydroxyethylcellulose, Glycol Stearate, Polysorbate 20, USP Colloidal Oatmeal, Propylene Glycol (and) Diazolidinyl Urea (and) Iodopropynyl Butylcarbamate, Fragrance, Tetrasodium EDTA.